For some reason, every time I play this song, I feel like I am swaying to the music. It just has that feeling to it. 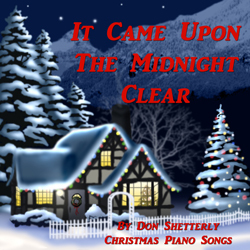 It Came Upon The Midnight Clear is one of my all-time favorite Christmas songs. I can feel the peacefulness and stillness showing through in this classic song. It is a song that gives hope even for what everyone has toiled through and dealt with in their life. Track #7 of 15 songs on Christmas Piano. Written by a Unitarian minister from Boston, Edmund Sears. In 1849, he wrote it as a poem and Richard Willis wrote the music for this hymn. The message of the song was peace on earth, good will towards men. Because of the civil war at the time, Edmund Sears wrote something that tried to shed the light on his concerns about the social situation in the United States. Edmund Sears was co-editor of the Monthly Religious Magazine where most of his hymns were first published. He also had a lesser known hymn, Calm On The Listening Ear Of Night. And ever o’re its Babel sounds, The blessed angels sing.